The littlest one is 18 months old. I am starting to be able to breathe again… a little! 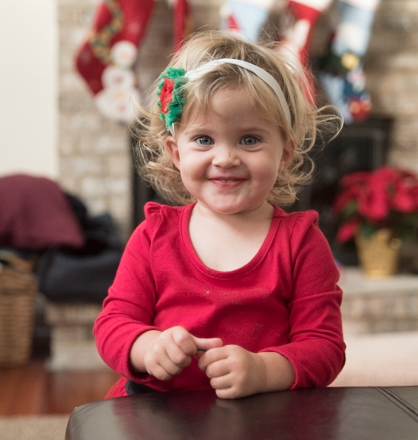 At 18 months old, she is repeating everything and can say lots of words. It is cute to hear her say all of the other kiddos’ names and her grandparents, aunts, uncles and cousins. I like to call her Piper as a nickname, I think it’s more suited to her personality. She is very excited to be able to jump, and takes most of her cues from her older siblings. She likes to take off marker caps and draw on anything, and then not re-cap them. She wants to sit in the big kid seats at the table & on stools – no more high chair! There is lots of running, she loves to run and it is soo cute to watch. Sitting still doesn’t happen too much, and grocery shopping or being constrained are not her favorite things. When the older kids leave for school in the morning, she blows kisses and yells BYEeeeeeeee!! She can understand most directions and likes to play with the older kids. Usually she ends up taking something away or breaking something and they get frustrated. Quite a temper! We like to bang our head on the floor, wall, cement, crib – whatever is available – when mad. It is tough to watch! She will also yell and hit when she gets mad. K is my best eater! She LOVES hummus. Cucumbers and hummus, sauerkraut, Hilary’s bean burgers, guacamole, avocado, pumpkin seeds. She’ll try whatever I’m eating. Usually the greens get spit out, but I like that she tries them! Loves her dolls!! She sleeps with a doll, and brings a doll everywhere she goes. Switching from 2 naps to 1 nap was stressful! Trying to figure out what time the one nap should be, the little cat naps in the car that ruin the rest of the day – killer! I finally figured out that after 4 hour wake time, it should be nap time, and this is key to a good nap. That nap gives me a little bit of time! The nap is around 11/11:30am – 4 hours after she wakes up. L gets picked up from pre-school at 12, so thank goodness for my dad that brings her home from school for me! That gives me about 40 minutes of quiet! I feel like I am finally getting a little more time to get things done! Just this week I finally moved some pictures on her bedroom wall that were not lined up properly and not centered, and that felt so GOOD to not have to look at them anymore 🙂 I feel like many things have been on hold for 18 months! I know it’s only getting easier and I can’t believe how fast time goes.